Finance at the Department of Management, Faculty of Economics and Business, University of Bengkulu, Jln. WR Supratman, Kandang Limun 38121 Kota Bengkulu, Indonesia. Faculty of Teacher Training and Education, University of Bengkulu, Jln. WR Supratman, Kandang Limun 38121 Kota Bengkulu, Indonesia. 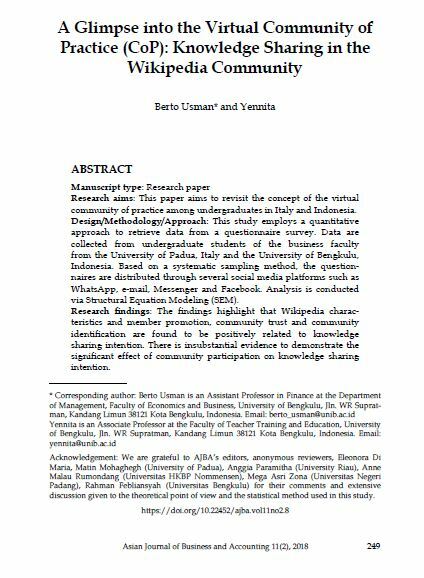 Research aims: This paper aims to revisit the concept of the virtual community of practice among undergraduates in Italy and Indonesia. Design/Methodology/Approach: This study employs a quantitative approach to retrieve data from a questionnaire survey. Data are collected from undergraduate students of the business faculty from the University of Padua, Italy and the University of Bengkulu, Indonesia. Based on a systematic sampling method, the questionnaires are distributed through several social media platforms such as WhatsApp, e-mail, Messenger and Facebook. Analysis is conducted via Structural Equation Modeling (SEM). Research findings: The findings highlight that Wikipedia characteristics and member promotion, community trust and community identification are found to be positively related to knowledge sharing intention. There is insubstantial evidence to demonstrate the significant effect of community participation on knowledge sharing intention. Theoretical contribution/Originality: This study expands on existing literature on virtual community of practice by offering a comparative analysis of two different samples from Italy and Indonesia. Practitioner/Policy implications: The findings of this study suggest that virtual communities of practice are important vehicles of knowledge sharing in universities. However, many approaches need to be taken in order to ensure that the distribution and circulation of knowledge is properly conducted among members so as to sustain the dynamics of knowledge sharing in the community of practice. Research limitation: Future research needs to emphasise on collecting data from diverse respondents in different geographical settings so as to increase the generalisability of the findings. USMAN, Berto; Y, Yennita. A Glimpse into the Virtual Community of Practice (CoP): Knowledge Sharing in the Wikipedia Community. AJBA, [S.l. ], v. 11, n. 2, p. 249-276, dec. 2018. ISSN 2180-3137. Available at: <https://ajba.um.edu.my/article/view/15297>. Date accessed: 25 apr. 2019. doi: https://doi.org/10.22452/ajba.vol11no2.8.